I got eight hours of uninterrupted sleep on Friday night — those deep, refreshing sort of zzzs I'd give up most of what I own to guarantee on a regular basis. And the cause? 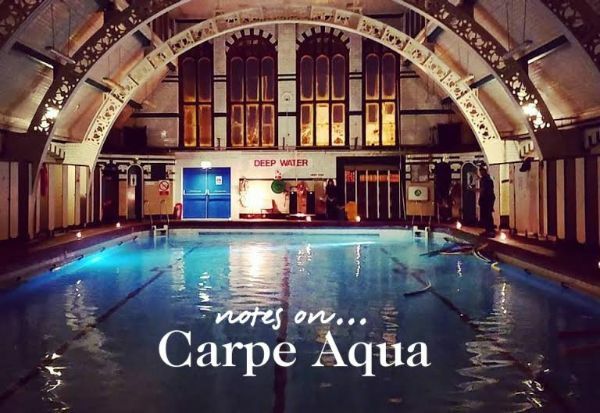 A couple of candle-lit hours bobbing around in the properly beautiful Moseley Road Baths, also known as Carpe Aqua. Having wanted to create an event like this since lifeguarding in his twenties, music man John Mostyn (he's widely credited with launching Ocean Colour Scene) is exactly the host you're hoping for, simply saying "Welcome" with a knowing smile when he opened the big old Edwardian doors to the swimming baths, heated to be warmer than the Caribbean Sea. John's created so much more than an after-hours splash off Balsall Heath's main throng. For the no more than twentyish people that get to attend each session of Carpe Aqua, it's like a club you feel privileged to be in, a smile-filled, tech-free bit of space with a total blinder of a soundtrack coming from an altar-like audio stack at the foot of the pool. John takes requests but expect everything from opera to club classics, while a mermaid weaves around your feet. You can decide if she's real or not. This is not an evening swimming sesh for the competitively minded: if you want to do lengths, head elsewhere. But if you want to stretch, chat a little, maybe study the Grade II* listed roof whilst balancing on one of the gazillion floats provided, try and bag yourself a spot. And avoid going in a big group — maybe even try this one solo? I can't remember the last time I felt so completely content to be somewhere.